← The Plot’s Intact, But Where’s the Motivation? 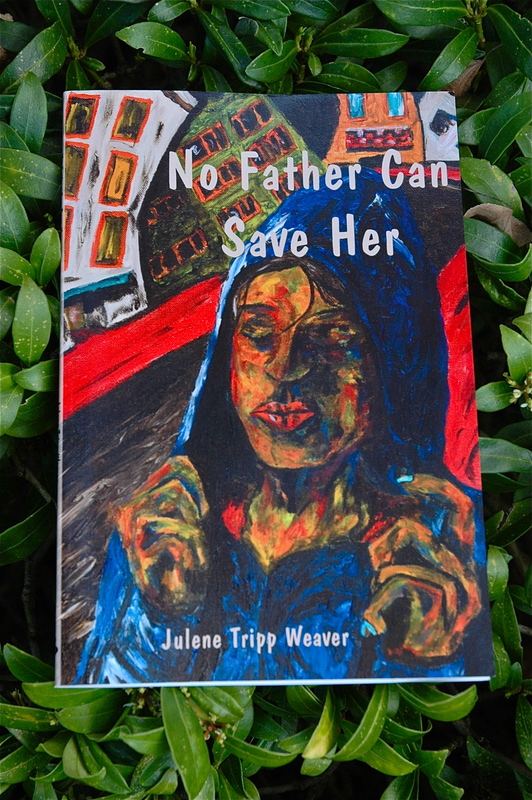 Julene Tripp Weaver’s latest book of poetry, NO FATHER CAN SAVE HER, was published by Plainview Press in 2011. This powerful collection tells the first-person story of a girl navigating the physicality of the journey from youth to adolescence (and ultimately adulthood) in the wake of her father’s death. Julene’s choice of details keeps us focused on the body—not just the girl’s awareness of her own bloom of sexuality and the men responding to her development, but also her father’s slow battle with Hodgkin’s lymphoma. As NO FATHER CAN SAVE HER progresses, the poet moves us from youth and loss into a jubilantly comfortable womanhood, where she discovers connection and healing. The memories of her family remain, and are explored in the last four poems, but now it’s a different kind of telling. More distant, like a photograph. The pain is still saturating the picture, but she can focus now on other memories. Tearing down red velvet wallpaper that has yellowed. The texture of her grandmother’s muskrat stole. The divide between the snowstorm and the heat waiting inside. Julene excels at employing concrete details to convey volumes about the journey within. Her story is about an individual life, and yet the descriptive, unflinching way she approaches her material allows it to resonate with readers in a very personal manner. She’s also the author of a poetry chapbook, CASE WALKING: AN AIDS CASE MANAGER WAILS HER BLUES. One of the poems from that collection was featured on Garrison Keillor’s Writers’ Almanac. Julene’s next reading is scheduled for 7 p.m., Wednesday, May 11, at Park Place Books, 348 Parkplace Center, Kirkland, Wash., in conjunction with Brian Whittingham from Glasgow and Sharon Cumberson. She will participate in the Burning Word poetry festival on Saturday, May 21, outside of Leavenworth, Wash. Admission is $14 for a full day of poetry, from 9:30 a.m. to 6 p.m. Julene will be on stage from 2:30 to 3:30. She’ll be featured with Maya Zeller, Linda Cooper, Chris Jarmick, Cyntnia Neely and Roberto Carlos Ascalon. For more information, see the Burning Word website. Julene will present her work from 6 to 7:30 p.m. on Thursday, June 9, at the Ballard Library, 5614 22nd Ave. Northwest, Seattle, along with Idore and Katherine Grace Bond. 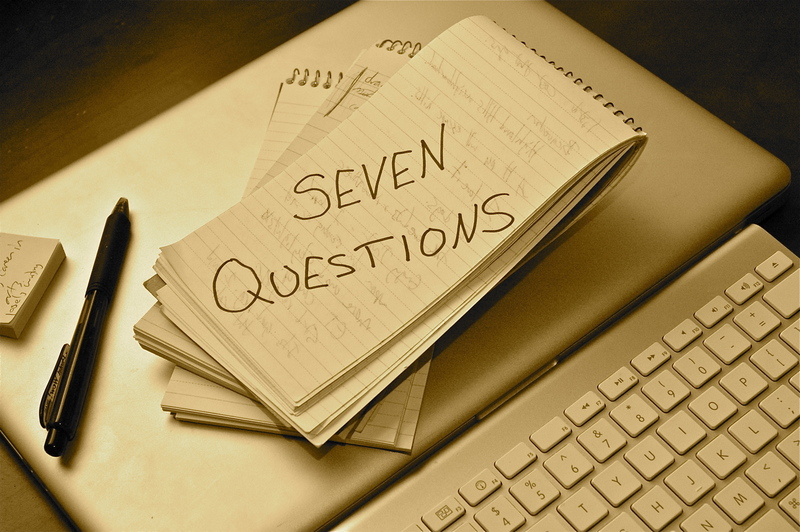 Welcome to Seven Questions, Julene! 1. Tell us about your new book, NO FATHER CAN SAVE HER. Julene Tripp Weaver's latest book features cover art by Duane Kirby Jensen, also a Washington resident. I’m really proud of this birth! It’s a beautiful book with incredible cover art by Duane Kirby Jensen. He’s a local artist in Everett, Wash., that a friend introduced me to. As soon as I saw it I knew it was the perfect image for the character in my book, she’s in the city, on the street in a hoodie, with blue fingernails! And lots of fire-red in the background. There are numerous themes in my book. The primary theme is loss and grief, then women’s sexuality, from a very personal perspective. It’s a book that takes risks with taboo subjects such as interracial dating and family secrets. NO FATHER CAN SAVE HER is listed on the Plain View Press website as a biography/autobiography. These poems are very much a part of my history, but everything in the book is not an absolute truth, the poems in my book encompass a field I have been obsessed by: the search by a young girl who lost her father at a young age and was left with a crazy mother, how to figure that out, how to survive. It’s universal. I still work hard at survival, and as a book there is much left out of the full story, as in any writing. 2. The structure you’ve achieved is fascinating. Each poem stands on its own; united as a collection, your pieces form an intensely personal coming-of-age story with a strong narrative arc. Did you write chronologically, or did you arrange the poems after they were finished? Were there poems you wrote for this collection that didn’t end up fitting? Ones that were modified to benefit the whole? No, I don’t write chronologically. Putting the book together was a long process over years as I sent it out in a variety of orders and sizes; it took assistance from other writers; I paid a manuscript developer for her input. She knows the publishers and helped me with my first draft. The first manuscript was 48 pages. After about 36 rejections I did a revamp, paying someone else, and added poems to increase the book to 60 pages. This was the book that was finally accepted. Once accepted, the publisher asked me to increase it to 80 pages. Two poetry friends reread my final collection. So the reorganization, the adding and changing, never stopped. Through the process I also played with slimming it down to a chapbook size, even though that wasn’t what I wanted to publish. When I received notes on a rejection letter, they liked my work I knew I was on the right track. One press liked my full size manuscript, but wasn’t compelled to publish it. I had to keep going back and reworking it over the six years. There were poems in the body of work that I was drawing from that did not fit the arch of redemption and finding love. The adage kill your darlings fits for this book. It’s hard for the author to do this, so that’s why I believe we need feedback. One of the centerpiece poems, “Meant to Be,” had to be modified to work. That is a very personal poem about my current long-term relationship. It needed to be paired down and made more general for it to work in the book. It’s still very specific, and I had to request permission from my partner to use the poem. There are always edits of course, but other than this one poem there were no major rewrites, just organization changes. 3. What’s your editing process like? Do you craft one poem until it’s done, or do you have several works-in-progress in various stages of development? I work on several works-in-progress in various stages of development. Some poems take years to finish. Others come out nearly complete. Some go into my junk file! 4. How is NO FATHER CAN SAVE HER similar to your 2007 chapbook CASE WALKING: AN AIDS CASE MANAGER WAILS HER BLUES? How is it different? Has the way you approach poetry changed (or not) in the past few years? And, the process, where my goal was to publish a full-size book and I had to reform the book multiple times. My manuscript CASE WALKING was accepted in chapbook form by Finishing Line Press in 2006. My chapbook took about the same amount of time to be birthed as did NO FATHER. It is different in subject matter. It is still personal. There are still poems that use the writer’s prerogative to create for artistic and emotional truth. A process I learned about creating a manuscript is to put together a pile of all your completed, or near completion, poems. Then have a group of people read through them, and very quickly say whether they fall into a one, two or three categories. No, not in the manuscript (not strong). I did this process with my over 100 AIDS poems with nine people where I worked the top ones are in my chapbook. It was very helpful, and I was lucky to have so many people give me feedback. A few of them were writers. This is an amazing quick way for a group to pull together, and it can be as few as three. A good friend told me about this process, which she did in a group of three each did the process for each other. 5. You’re a poet and a healer. How do the two work together? I think writing evokes healing. There is a long tradition of poetry therapy and an institute and certificate program to become a poetry therapist. I didn’t go though that process. But, I know from my own experience that through writing there is the opportunity to explore and understand oneself and emotions. It is a way to look back and change the future. In writing you don’t know what’s going to come. So you can create and recreate, you can change your history. There are many ways to change through writing. In my therapy practice I encourage people to keep a journal. I have a long history using Continuum Movement to do hand-to-page exploration. The founder of Continuum runs Poetry in Motion workshops with Rebecca Marks, now called Writing the Wave. I’ve been doing Continuum since 1988, and in 1996 I did my first Poetry in Motion intensive. It combines beautifully with healing and writing, because truly you learn there is no such thing as writer’s block. That you can go back to the breath or the body to the page, it’s all in the line. The tip of the pen is the end of our nervous system, and it is constant expression when we allow. Many of my poems came out of this well. After I did my first group with Emilie and Rebecca, I ran groups for ten years. My first poem that evolved into my writing about HIV/AIDS came at the workshop in 1996. 6. When do you write? Are you always composing in your head, or do you set aside certain chunks of time to work? Now that NO FATHER CAN SAVE HER has come into the world, what are you focusing on? I write whenever. I have no set time. Usually, I write in a journal when I am sitting with a pen and notebook. Or sometimes words come, and I grab my notebook and start to follow the words. Also, when I do movement, or when I wake with a dream. Whatever I can capture is raw material to follow. I’ve been in a Dangerous Writing fiction group since 2003 working on my creative nonfiction manuscript, which I started in 2002 when I started Tom Spanbauer’s Dangerous Writing team. My work is dangerous, and I want to eventually publish some stories and a book that is a variation of a novel. As for poetry I’m in a fallow period. I just gave birth to NO FATHER CAN SAVE HER. I keep a journal, that I then go through and cull for images, ideas, and poems. I don’t worry about writing daily. I’m usually in a writing group for feedback, but with the publication, and changes in my life, I withdrew from my poetry group because it wasn’t fair to the other members, my attention was not present. So I plan to stay with my fiction group and wait for poetry to come back. Meanwhile, I still have lots of poems to submit that call to me they want a home. I’ve come and gone from writing my whole life, because I’ve always wanted to write. Sometimes it wasn’t possible. What I know is I always come back to writing even if I go through a fallow time. 7. You’ve studied Dangerous Writing with Tom Spanbauer. How did his teachings influence your journey as a poet? Who else has made an impact on your writing? I’ve been drawn to strong powerful teachers. Tom Spanbauer gave me courage and support to continue to follow my obsessions and to write about taboo subjects. In the 1980s I signed up to the Creative Writing program at CUNY so I could study with Audre Lorde at Hunter College, and Joan Larkin at Brooklyn College. It was the height of the feminist movement, and I was inspired by the poetry of June Jordan, Sonia Sanchez, Judy Grahn, Adrienne Rich. After moving to the northwest I found writing-about-poetry by William Stafford, Richard Hugo, Philip Levine, Stanley Kuniz, Charles Simic. Back in the early days I read Peter Elbow! So this was a new well to dip in. I love reading contemporary poets such as Dorianne Laux, Patricia Smith, Tim Siebles, Belle Waring, Sharon Olds; really the list is endless. Seattle and Portland are rich with local poets: Lana Hechtman Ayers, Penelope Scambly Schott, Elizabeth Austen. One of the best things a poet can do is to read the work of other poets. Also, about five years ago I joined WOMPO, the Women’s Online Poetry Listserv. That has been a tremendous learning and networking experience with other poets worldwide. It’s how I met Penelope in Portland, and I’ll be reading at her Salon in May. Thanks so much for your thoughtful responses, and for telling us more about the process of creating a poetry book, Julene! You can buy NO FATHER CAN SAVE HER through Plainview Press or Amazon. Julene’s writing site features more information about her career as a poet and her schedule of upcoming readings. She engages in wordplay on Twitter. She was interviewed by Tracy Darling on Blog Talk Radio, starting at 4:20, here. This entry was posted in Books, Seven Questions, Writing and tagged editing, interview, Julene Tripp Weaver, memoir, poetry. Bookmark the permalink.